A review of AB Conservatories Ltd - trading as AB Conservatories - based in Tadley, Hampshire and owned by Andy Brown (not to be confused with any similar sounding companies). This website in about a Conservatory that was designed by Mark Smyth of Smyth Consultancy Services Ltd and built by AB Conservatories Ltd. It is completely objective and contains real, unedited photos taken during and after the build. AB Conservatories Ltd quoted for the work in July 2011 and commenced building in December 2011. The was to be done to Building Regulations approval. Insufficient support of the main Box Gutter, which deflected under load. Unsafe Electrics installed in the conservatory, the mains cable in the roof ridge actually burnt through potentially make the roof life. Furthermore, the cables buried in the wall were not aligned horizontally or vertically. The electrician is not Competent Person Scheme registered and cannot issue a Part P certificate. Inadequate Waterproofing was installed under the conservatory roof. Concrete was stuffed in the gap between the gutter and the brick wall. To pass Building Control inspection, the roof was lifted (by another contractor) and a plastic sill installed. Generally poor workmanship applied across the whole build, in particular the Brickwork. Once rectification work had been commenced by an alternative contractor, numerous other faults were found. Due to legal action it was not possible to show these pictures sooner. 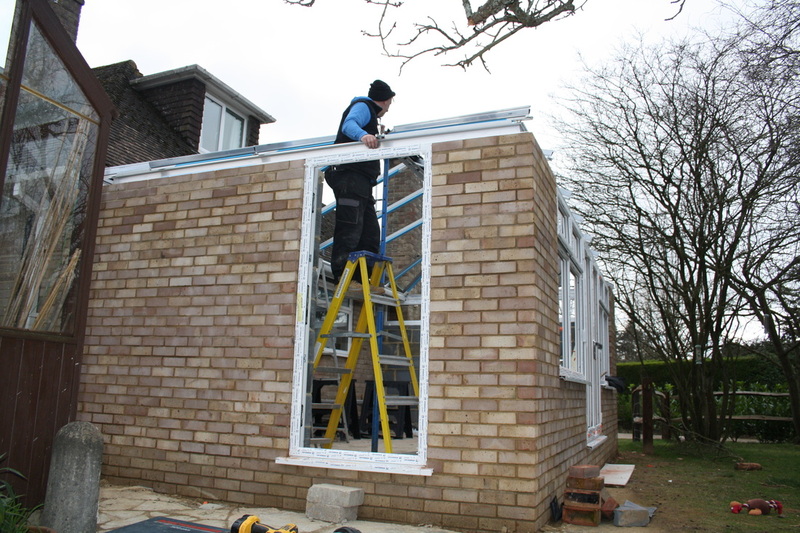 On this site you will see the Design of the conservatory and the associated importance of the Box Gutter. The installation practices of AB Conservatories is covered in the Installation page, and you can see examples of the poor quality Brickwork too. The Electrics were particularly unsafe, and the Waterproofing failed Building Control inspection. The Joinery wasn't up to much either. AB Conservatories Ltd is owned by Andy Brown and Zena Brown and are based in Tadley, Hampshire. AB Conservatories Ltd was featured on Checkatrade. We read the reviews and thought the company had a good reputation. We have contacted Checkatrade and the profile for AB Conservatories Ltd has now been removed.